As most of you know, I recently lost someone dear to me to Alzheimer’s, and learned about Alice’s Embrace the same day. I was inspired to knit for them, in my friend’s honor, and I am hoping you will knit and crochet along with me! I love this pattern – it is working up quickly, as you can see, and is relaxing to knit. It’s not complicated, and so it is a piece I can work on even at the end of a long day when my brain is too tired to deal with anything too complex. That looks lovely so far! Gorgeous… you’ve really made progress. 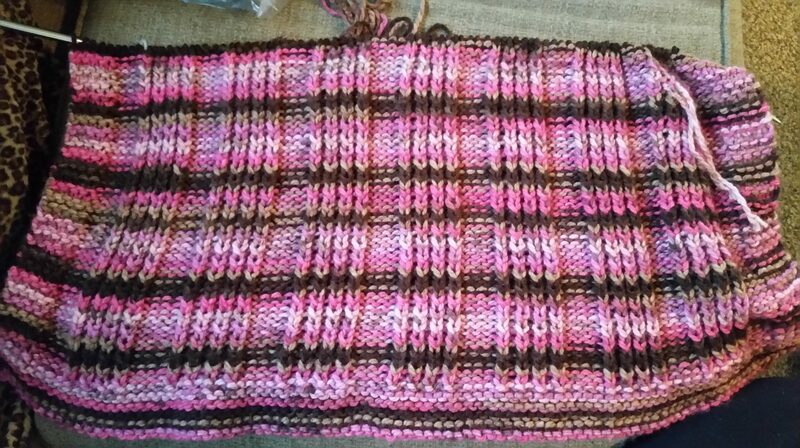 I love how the self striping yarn is complementing our Sing The Song pattern. Your dear friend is proud of you Elizabeth, and I know that this beauty will bring so much comfort to its new owner. I look forward to seeing it in person and getting an Alice’s Embrace label sewn on it.